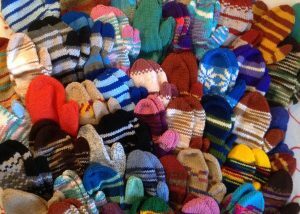 We are so honored to have been the charity that was the subject of the article on charity knitting in the Interweave Knitting Holiday Issue 2017 – www.interweave.com/article/knitting/charity-knitting-makers-hands This beautiful article will show you what might happen with the pairs of new mittens and gloves that you create and donate to Mittens for Detroit! We accept pairs all year, so it’s never too early or too late to mail them in! Looking for a pattern for knitting or crocheting mittens? How about a tutorial for creating upcycled pairs? You’ve come to the right place! If you knit, there are many patterns online – we like this Easy-Knit Mittens by Lion Brand. (link website: http://lionbrand.com/patterns/80673B.html). Here’s another video tutorial for upcycled mittens. This one uses a single sweater and hand-sewing. You can use more than one sweater (one for the front, one for the back), and you can use a machine to stitch it faster. This was sent to us by Mittens for Detroit supporter Lori Colburn!